Hello fellow D56 Collectors!!! My name is Anita Sanford and I am the president of the North Florida Village Collectors Club in Jacksonville, FL. Our club was started in November 1996. We have attended many gatherings over the years, particularly the ones that were held in Atlanta, Greenville, South Carolina, Fort Lauderdale and the Tampa area. Unfortunately the last D56 gathering in the southeast was in August 2007 in Clearwater. 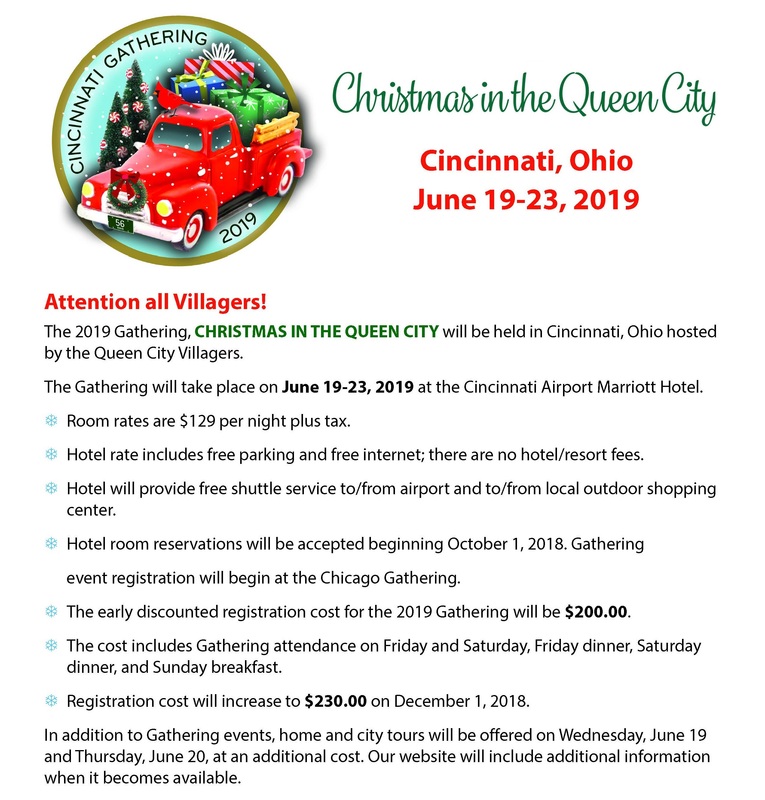 We have an opportunity to collaborate with the Train Collectors Association and do a joint gathering with them June 21 – 28, 2020. We have three gentlemen in our club that are also part of the train club. We discussed this collaboration last fall and over the last few months have gotten the Ok from the NCC President, Sue Chretien, to go forward with this event. Richard Walker, who is copied on this email is a member of our club as well as the train collectors club. He has been reaching out to many of the NCC folks and I have done the same. We want you and your clubs to be aware of this event and get it on your calendars. We are also asking for support for this venture. Our club has about 24 members. We are excited about this opportunity but know it’s a huge undertaking and we will definitely need the expertise of those that have participated in these events in the past. We would appreciate any response and/or suggestions you may have. The good thing is the the Train Collectors Association has already secured the venue in Jacksonville, The Hyatt Hotel. They have a block of rooms reserved along with ballrooms. The train collectors typically run their conventions from Sunday to Sunday. During the first part of the week they will have many events scheduled including home tours of train collectors, tours of neighboring cities (St. Augustine and Fernandina Beach), a train ride to Orlando and many other activities that the D56 folks are more than welcome to participate in. Our event will probably run Thursday night – a Sunday morning farewell breakfast. We will have the market place, seminars, bingo and a banquet. There is also a local club in Tampa, FL, The Tampa Bay 56ers, Denis Gillen is the president of the club. His email is dennygee@aol.com. You might want to reach out to him about downsizing your collection. At our gathering we will have a marketplace that you can buy a table for $25 to sell pieces. Of course if you are interested in donating pieces we would be happy to discuss that with you. I know that seems like a long ways off but it will get here quickly. I look forward to hearing from you and will appreciate any suggestions, comments on the event, willingness to volunteer etc. My email is msan71082@bellsouth.net and my cell number is 904 662-6403. Please feel free to call or email me. If you are having trouble sending the email, please click here.